When you point to the Calendar icon on the navigation bar, the Calendar peek shows your upcoming appointments and meetings. 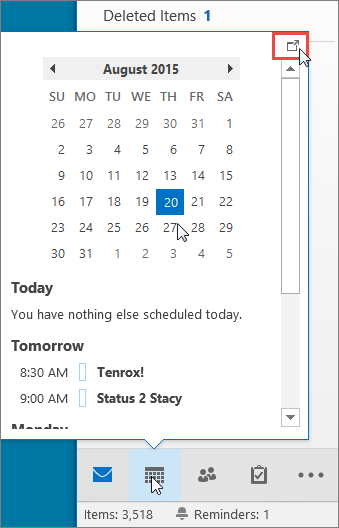 To always be able to see your upcoming items, dock the Calendar peek to the Outlook window. To close the peek, at the top of the docked Calendar peek, click . When a peek is docked or not docked it only affects that view. 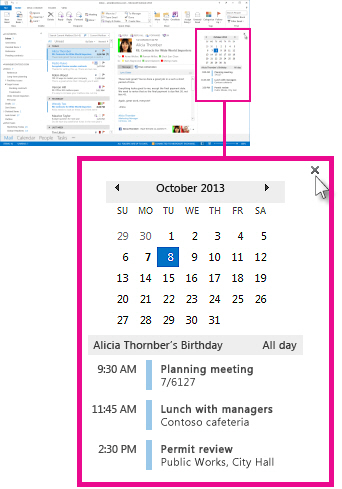 For example, if you’re in Mail and pin the Calendar peek, when you switch to Tasks, the Calendar peek doesn’t appear. You can dock or undock the Calendar peek in each view by clicking or .